You will love the simplicity of this idea. Just make the entire loaf of bread at once into french toast. I love to use marked down loaves of bread for this. 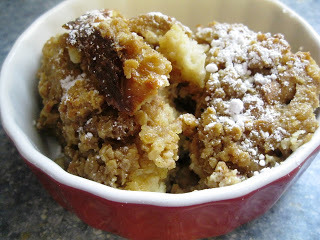 It's a very inexpensive way to make a warm homemade breakfast on the go! Cook the whole loaf of bread into french toast like you normally would. 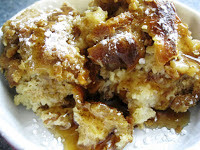 Now, lay out the cooked french toast onto cookie sheets that have been lightly sprayed with non-stick spray. Flash freeze the toast by placing the cookie sheets in the freezer for 30-45 minutes till the toast slices are individually frozen. 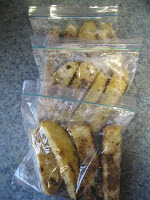 Remove the frozen toasts from the cookie sheets and stack them back into the empty bread bag. Tie bag closed and store in freezer. To cook frozen french toast: Let your kids pop 2 of them into the toaster. Many toaster now have a "frozen" button to push to help cook them. I like this method better than the microwave. Kids from toddlers to teens like french toast sticks! I mean who doesn't like to dunk their breakfast, right? I like to make french toast sticks in a big cooking session using discount bread (Texas toast is great !) or in my case, today I had a loaf of bread not rise well, so I baked it off anyway and sliced it thick into sticks. I wonder what left over banana or zuchinni bread would do? I never have left overs of that, but it does sound intriguing! Slice bread into sticks, dunk sticks into your prepared egg batter and cook in skillet or oven bake on a cookie sheet as desired. I sprinkled a little cinnamon over the sticks as they cooked. When all sticks are done, let cool. I prefer to pre-bag these into sandwich bags with 4-5 sticks per bag to store in the freezer. That way my kids can grab a bag, put it on a plate, microwave it for a few seconds and dunk away. But a toaster oven would be great for these also! I love to save up all the end pieces and left over hot dog/hamburger buns in the freezer already cubed up in a bag until I have enough to make french toast casserole. I also grab loaves of discount bread when ever I see it too! I grab enough to make at least two casseroles for the freezer. You may not realize it, but you can freeze the bread/egg mixture before it bakes. It is so convenient to take it from the freezer to the refrigerator the night before to let it thaw and then bake it in a pan in the morning. 12 slices of bread cubed into chunks. n a mixing bowl mix together the eggs, milk, cream(or half & half or evaporated milk), cinnamon, vanilla till well blended. Pour egg mixture into freezer bag over the bread cubes. Seal bag and gently shake to mix bread and egg mixture together. Set aside to make the topping. Place frozen bag into the refrigerator the night before you want to bake it. In the morning. Butter a 9x13 baking dish. Fill dish with the egg mixture. Sprinkle the topping in little plops of crumbles over the egg mixture. (optional). Bake at 350 degree's for 45-50 minutes or until it is golden brown and egg mixture is cooked through. Serve in bowls with powdered sugar and maple syrup.